On Tuesday Sept. 1 7:30PM, the FUHSD board members will cast their final votes on the Lynbrook High ATT cell tower lease renewal. Please attend this meeting with your friends and neighbors to speak out your oppositions to the ATT renewal! Please wear our “no-tower” T-shirts to show our power! Together we can stop ATT's cell tower from radiating to the Lynbrook High students for another 25 years! Please help us pass this flyer to your friends and neighbors. 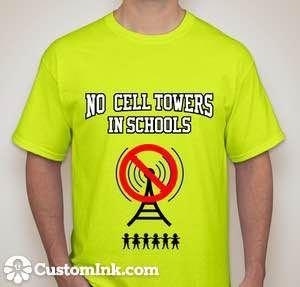 The "No Cell Towers In Schools" T-Shirt is available for purchase! The T-shirt is $20 each, and all the proceeds will be used for our legal actions. Please fill out your info in the following form. Sincerely appreciate your big support! We are taking legal actions and so really need your financial supoort! Please make a donation to Our Non-Profit Organization NoTowerInSchools via Paypal, or write a check payable to "NoTowerInSchools" and mail the check to PO Box 700521, San Jose, 95170. Paper petition "No Wireless Antenna Towers In any Cupertino school": paper signatures usually have more weights than online signatures. Please scan and send the signed forms to notowerinschoolsinfo@gmail.com. Online petition: "No Wireless Towers in Any Schools of CUSD/FUHSD"
If you are FUHSD residents, please sign this petition "Void FUHSD School Board Member Bill Wilson's Voting Right on Cell Tower Installations Due to Conflict of Interests". Dear donors of NTIS, NTIS really appreciates your generous donation in 2015. All your donations are tax-deductible. Please download the NTIS donation tax deductible notice from our web site. Please check out the NTIS official Lynbrook Gym Roof Structure Report prepared by Zhihui Huang, Ph.D. P.E., S.E. Please also sing this petition to help NTIS's law suit against Fremont Union School District regarding Lynbrook Gym Roof Safety. On Tuesday Sept. 1st 6:30PM, the FUHSD board members will cast their final votes on Lynbrook High ATT cell tower lease. Please attend this meeting with your friends and neighbors to speak out your oppositions to the ATT renewal! Please wear our “no-tower” T-shirts to show our power! 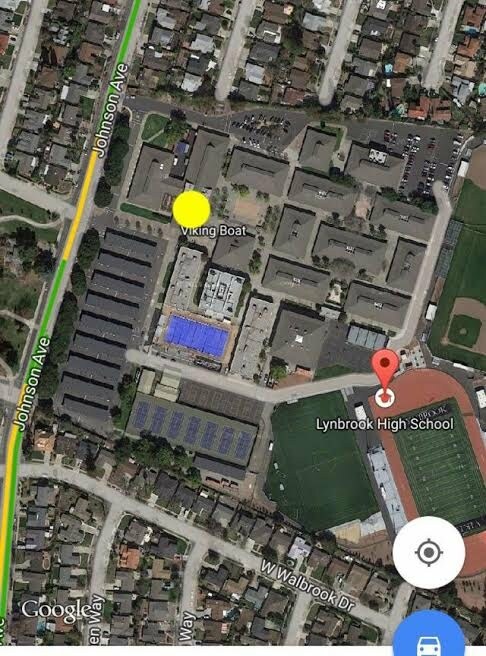 Together we can stop ATT's cell tower from radiating to the Lynbrook High students for another 25 years! Please help us forward this flyer to your friends and neighbors. There are 7 cell poles on Lynbrook gym roof. The Gym has been leaking raining water after ATT's 4 cell poles were installed in 2011, a sign that the 50-year-old roof is lack of maintenance and may be overloaded. If the roof collapses in strong storms or earthquakes, the 7 cell poles may not be straight any more or fell down. Your kids and nearby neighbors may be exposed in high radiation. On behalf of No-Towers-In-Schools Corp-----a non-profit organization, funded by hundreds parents of FUHSD, we want to bring your attention to numerous misconducts of the Fremont Union High School District Office; and some of these may have legal issues. Current rent from ATT cell towers at Lynbrook High School gym roof exceptional low of $1639/month, which is 20-25% of market price as we know, and 40% lower than the average of all other existing cell towers in same site at $2600 around. We want to know how ATT got such favorable contract. Being a Superintendent, Mrs. Polly Bove has been holding ATT stocks since 2010. Per district officer, all communications between the district and ATT for this cell tower contract from 2010 is lost in the computer server except an extension request sent by ATT in June, 2015. The district never provided a market research analysis report on the cell-tower rental market in 2010 when it was contracting. The district also never responed when the public asked if the district accepts whatever ATT offered without any bargain when it was contracting. These questions raised deep concern on legality of the 2010 ATT contract, such as severe corruptions or conflict of interest, since no record was available to examine the contracting process. At the district meeting that was for discussing Verizon's cell towers on Feb 3rd, 2015, the district office was asked by the Board of Trustee to conduct an INDEPENDENT report for the safety and necessity of Verizon's cell towers. A couple of weeks later, the district ordered the report from Bill Hammett, a contractor that worked for the Verizon. The report, was not an “independent” but favored by Verizon since Bill Hammett has been Verizon’s contractor for many years. The district was aware of it in advance. Per Bill Hammett, the report FUHSD ordered is same as the one he did for Verizon. He had presented the report in public hearing in front of all board trustees and the district officers on Feb 3rd, 2015. It's wasting public fund to order a duplicated report. The goal is to cheat the public and board trustees. The district uses public fund for presentations on public hearing only on one-side, which is favoring vendor, not both-sides of two-sided opinion. As a public facility, the district should provide presentations with both-sides opinion on public issues. However, the district uses public fund on only one-side presentations, and even a presenter is the cell companies' contractor with biased opinions and the district is aware of it very well. Next Tuesday, 08/18, Bill Hammett, the cell company's contractor, is hired by the district to do a presentation again on a public hearing favoring ATT cell tower lease extension. The district is not on a neutral and impartial position on public issues and fund use, but a highly biased position. After the aforementioned report being disqualified to serve as evidence, the district officer invited parents and Bill Hammett to measure the RF in a few school sites on May 1st, 2015. The measurement, tested by Bill Hammett and monitored by parents and staffs, revealed that the RF radiation at Lynbrook High School was several hundred times of a school without cell towers. The test confirmed our parents' earlier measurement results and the instrument used in line was on a professional standard. However, the district office has failed to deliver the final report despite repetitive requests from parents. Refusing to issue the formal report on the measurement of RF from cell towers, the District used public fund to order a total RF measurement from a different company-EBI Consulting. 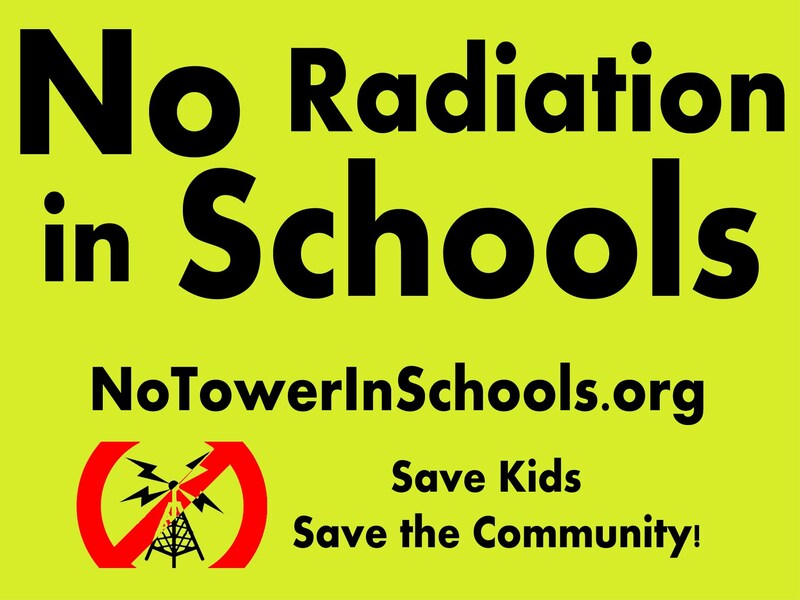 The EBI report revealed no cell towered school had higher total RF radiation than schools with cell towers. The district office officially post the EBI report on its web site now, in the field of "Cell equipment". This tactic intends to confuse public and the board of trustees by substituting the cell tower RF with total RF including non-cell-tower and cell tower RF. The fund used on this report is for misleading public only. The district office made an arrangement with a science teacher, Roy Rocklin from Lynbrook High School, who is also a cancer survivor, to present that "the cell towers in the school is safer than no cell tower." However, the teacher's cancer is probably related to the long-time exposure of cell towers due to his job. This is equal to arrange a smoker with lung cancer to say tobacco is safe. To augment this presentation favoring vendor ATT, the district allotted a special 10 minutes for his presentation with power point slides to show an unrelated agenda item (10.1) on August 4, 2015, which should had been presented in public communication session for only three minutes without slide. District is public facility, the entire duty is providing safe environment for kids. However, FUHSD leases public property for commercial use to make revenue, despite strong opposition from thousands parents due to health and safety concern. And the district has used its authority and public fund to convince the board trustees to approve the cell tower's installation and extension lease. Attached please find all 9 cell towers rent in FUHSD, and ATT cell tower lease. Our lives begin to end the day we become silent about things that matter. -- Martin Luther King, Jr.
Great news! Fremont Union High School District board members voted 4:1 (Mr. Jeff Moe voted NO) on Tuesday April 28th to "deny Verizon’s proposal to install cell equipment at both Cupertino and Lynbrook High Schools"! We won this battle! NoTowerInSchools wants to thank everyone for their efforts and supports! Next step, removing all existing cell towers in FUHSD schools! At the April 28, 2015 Fremont Union High School District Board of Trustees meeting an agenda item for the Board’s consideration referred to Verizon’s proposal to add cell equipment to Cupertino High School and to Lynbrook High School. This item was previously included on the Feb. 3, 2015 FUHSD Board of Trustees meeting agenda. However, at that February meeting the agenda item was tabled and the Board of Trustees asked that additional information be obtained to ascertain whether or not there are any other viable alternate locations that would provide reliable communication at Cupertino High School and Lynbrook High School. Unfortunately, Verizon has not provided satisfactory information in response to the Board’s request. Therefore, FUHSD staff recommended that the FUHSD Board of Trustees deny Verizon’s proposal to install cell equipment at Cupertino and Lynbrook High Schools. When the agenda item concerning Verizon’s proposal was addressed at the April 28, 2015 meeting extensive public communication was received and community members provided their input about Verizon’s proposal. Included in this input was information presented by Verizon’s attorney. Following the public communication section of the meeting, the individual Board of Trustees shared their thoughts about Verizon’s proposal and communication provided at FUHSD Board meetings held in February, March, and April. A motion was then moved and seconded to accept the FUHSD staff recommendation to deny Verizon’s request to install cell equipment at Cupertino High School and Lynbrook High School. The motion was approved by a vote of 4-1. Therefore, the FUHSD Board of Trustees voted to deny Verizon’s request. " "Fremont union high school district are planing to install cell towers on Lynbrook and Cupertino high schools. The radiation generated by these tall eye sores can cause debilitating health effects of children studying there all year long. Studies suggest nearby families could get sick too, yet the board of trustees is erecting these toxic towers without required studies. Voting date is on May 19th. I need your help to stop this and protect our kids, please send email to board members to say No cell tower in schools: http://www.fuhsd.org/trustees ,or sign petition: http://www.ipetitions.com/…/no-wireless-antennas-in-cuperti… ,or call them at 408-522-2200." MYTH: FUHSD board says that the new wireless towers on Cupertino High and Lynbrook High campus are required for emergency communications. TRUTH1: In 2012, FUHSD deployed and tested successfully a district-wide Emergency Notification System used for contacting parents in the event of an emergency. TRUTH2: Look at the following table, out of the 5 high schools in FUHSD, Monta Vista High and Homestead High have NONE cell towers. How would those two schools handle emergency communications based on FUHSD boards' argument? In Lynbrook High our kids are exposed to RF radiation stronger than a using cell phone next to ear, when hanging out at Rally Court, for hours every day. Click here to review the detailed report. Our mission is to ban wireless communication facilities (i.e., towers, antennas, etc.) in schools. Our current objective is to stop Verizon's plan to install wireless towers in both Cupertino High School and Lynbrook High School. 4/27/15: We are collecting signatures (paper or online) for our petition "No Wireless Towers in any FUHSD/CUSD Schools". We have collected 2123 signatures (1216 paper & 907 online). 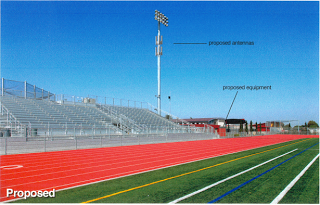 At Cupertino High School, Verizon's plan is to mount 6 panel antennas on an existing sports field light pole, a base equipment station located in a sports field building, and an emergency generator located in a fenced area on a concrete pad (click here for details). At Lynbrook High School, Verizon's plan is to install 6 Andrew Model SBNH-1D6565A directional panel antennas behind view screens above the roof of the gymnasium. The antennas is at an effective height of about 32 1⁄2 feet above ground, 4 1⁄2 feet above the roof (click here for details). Note that at the same places, 3 similar antennas of T-Mobile, AT&T Mobility, and Sprint are already in use. Copyright 2015 NoTowerInSchools, a California Non-profit Organization. All Rights Reserved.